One-dimensional magnetophotonic microcavity crystals with nongarnet dielectric mirrors are created and investigated. The defect layers in the magnetophotonic crystals are represented by two bismuth-substituted yttrium iron garnet Bi:YIG layers with various bismuth contents in order to achieve a high magnetooptical response of the crystals. 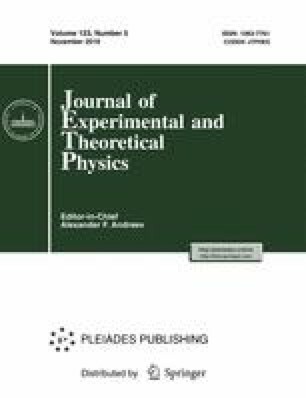 The parameters of the magnetophotonic crystal layers are optimized by numerical solution of the Maxwell equations by the transfer matrix method to achieve high values of Faraday rotation angle Θ F and magnetooptical Q factor. The calculated and experimental data agree well with each other. The maximum values of Θ F =–20.6°, Q = 8.1° at a gain t = 16 are obtained for magnetophotonic crystals with m = 7 pairs of layers in Bragg mirrors, and the parameters obtained for crystals with m = 4 and t = 8.5 are Θ F =–12.5° and Q = 14.3°. It is shown that, together with all-garnet and multimicrocavities magnetophotonic crystals, such structures have high magnetooptical characteristics. Original Russian Text © V.N. Berzhansky, A.N. Shaposhnikov, A.R. Prokopov, A.V. Karavainikov, T.V. Mikhailova, I.N. Lukienko, Yu.N. Kharchenko, V.O. Golub, O.Yu. Salyuk, V.I. Belotelov, 2016, published in Zhurnal Eksperimental’noi i Teoreticheskoi Fiziki, 2016, Vol. 150, No. 5, pp. 859–867.